GLUTEN-FREE, GRAIN-FREE, REFINED SUGAR-FREE, SPECIFIC CARBOHYDRATE DIET (SCD), PALEO. I love salads. I never thought I would say that. Honestly, in my pre-Specific Carbohydrate Diet (SCD) days, I was never a big fan of salads. This was largely due to the fact that I believed salads consisted only of lettuce and boring dressings. Since I started SCD, salads make up a huge portion of my diet. They are quick, easy to whip up and nourishing. Salads make me happy! A favourite hobby of mine is creating a delicious salad from ingredients in my fridge. My husband and daughter now eat a lot of salads too. When my daughter asks me for lettuce or cucumber, my heart sings! 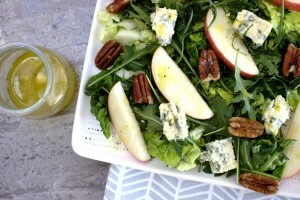 This Blue Cheese, Apple and Pecan Salad is one of my current favourites. Let’s talk about blue cheese. I remember the first time I tasted it. In a restaurant, I ordered a blue cheese burger. In fairness, the waitress even asked me if I am sure I wanted it as blue cheese was quite strong tasting. When it arrived, I almost spat it out! Now, I guess you could say that my palate has changed a lot. On a recent (and rare) date night with my husband, I tasted a local blue cheese Cashel Blue for the first time and I was absolutely hooked. It’s delicious and I get to support a local business by purchasing it, what’s not to love? 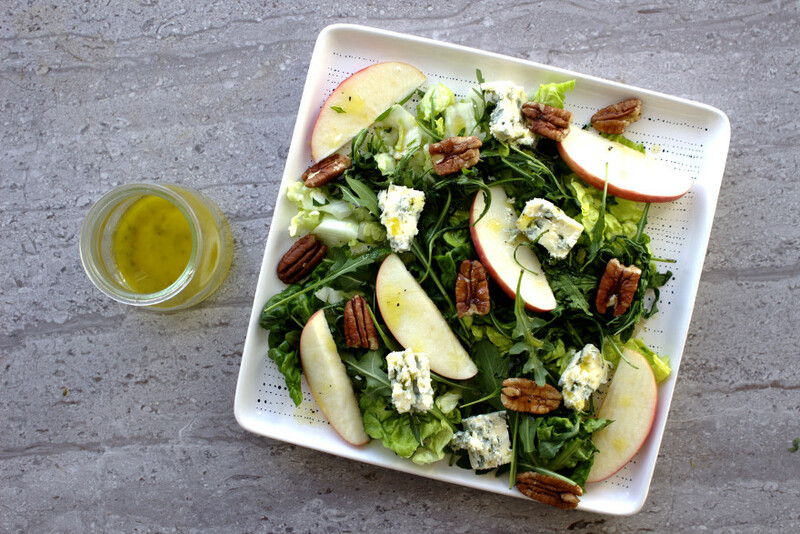 The apples work really well in this salad. They give it the perfect sweet n’ savoury kick. The pecans add crunch and some healthy protein and nutrients. Combined, all these ingredients make this Blue Cheese, Apple and Pecan Salad really hit the spot. You can use any greens you like. My favourites are baby gem lettuce and rocket. A delicious sweet n' savoury Blue Cheese, Apple and Pecan Salad. A great lunch option for a gluten and grain-free diet. Also, Paleo and Specific Carbohydrate Diet (SCD)-friendly. Arrange the salad on a place by first making a bed with the lettuce and rocket and then adding other ingredients. For the dressing: mix all the ingredients in a small jar and season with salt and pepper. 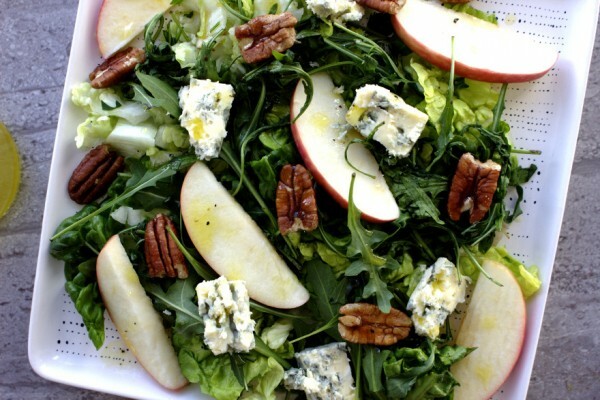 Drizzle over the salad and enjoy!